It’s difficult to talk about The Shondes, the Brooklyn-based alleged Next Big Thing, without first mentioning their political fervor, religious zeal and gender ambiguity, so there’s no point in not putting it out there: The Shondes’ (Yiddish for “disgrace”) stances border on Judaic extremism, three of their four members are female transgenders and the group rages on against the injustices it perceives in the world around it every chance they get. There. Now, on to the music. Employing elements of punk, hard rock, power pop, classical and Jewish folk music, it’s obvious the group has dutifully studied the playbooks of each of those schools. From the opening guitar lick and four-on-the-floor kick pattern of “Don’t Look Down,” the band fires relentlessly on all cylinders. Expertly anchored by the low-end swing of drummer Temim Frutcher, the violin flourishes from Elijah Oberman dovetail nicely with Ian Brannigan’s melodic guitar attack. Comparisons are often made between the band mad Sleater-Kinney, but that comes off more as lazy personnel comparison; The Shondes’ trad-rock fusion is actually more reminiscent of bands like The Pogues or The Tossers, who similarly utilised centuries-old musical stylings to advance their own agendas. 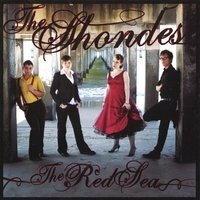 And also in the same tradition of those two groups, The Shondes’ mission and music are so heavily intertwined throughout The Red Sea‘s eleven songs that it’s hard to look at one without feeling the other looming so heavily over it. With song titles like “I Watched the Temple Fall” and “The Mother and the Colony,” it’s clear the group prefers the sledgehammer approach to subtlety. But perhaps that’s the point: if The Shondes set out to make music that absolutely forced the listener to take notice of what they’re talking about, mission accomplished. Their sexuality may turn off some, their fervor may alienate even more, but their songs are undeniably good and it’s hard to see these four New Yorkers really caring what you think of them. You’ve already listened. They’ve already done what they set out to do. To be fair, The Shondes’ final product is not as totally unique as their elements may suggest. Their sound borrows quite heavily from a number of the other latter-day garage rock revivalists – The White Stripes and The Strokes, to name two – and the musical arrangements and vocal melodies sound more Celtic than they do Gypsy or traditional Jewish. “These are the things that keep me alive,” Oberman sings on “Let’s Go.” Rock on, sister. Rock on.